Depositors of bankrupt banks have partially blocked Khreshchatyk Street in Kyiv, according to an UNIAN correspondent. People are demanding that the authorities, in particular NBU Governor Valeria Gontareva, refund them deposits they stored in the banks. About 100 participants of the rally were trying to set fire to car tires, but firefighters extinguished the fire on the scene. Several hundred law-enforcement officers, including police patrols and National Guards, are standing near the protesters. 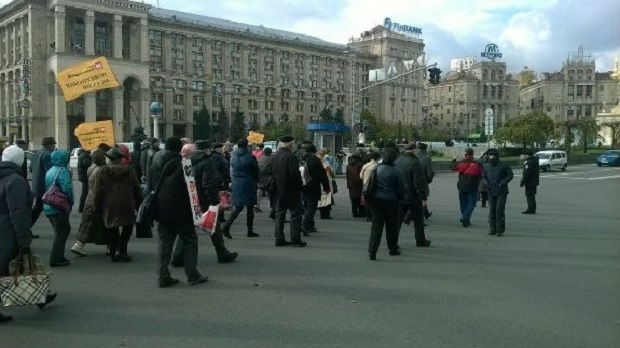 Participants in the rally do not allow trucks to move across Khreshchatyk Street, with the exception of public transport, namely buses. In addition, clashes between the depositors of insolvent Mykhailivskiy Bank and the police took place at the intersection of Khreshchatyk Street and Mykhailivska Street.